PA officials condemn President Obama's speech to the United Nations, say the speech was "idiotic" and "disappointed" the Palestinians." 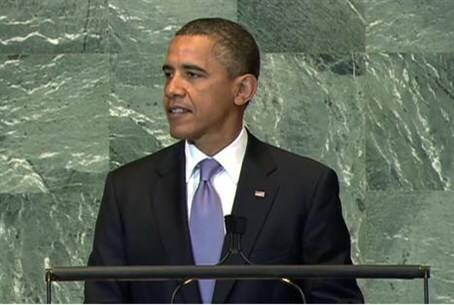 The following two videos, translated by the Middle East Media Research Institute (MEMRI), show two reactions by Palestinian Authority officials to President Barack Obama’s speech to the United Nations General Assembly last week. The speech was perceived as very pro-Israel and anti-Arab, because Obama called for direct negotiations between Israel and the Palestinian Authority and referred to Israel as the “historic homeland” of the Jewish people. “The Palestinian people number approximately 18 million, over 55% of whom live in the diaspora, in refugee camps, in conditions that I believe necessitate a stand on the part of the U.S. administration,” adds Rajoub. Erekat says that Obama’s speech has “disappointed the Palestinians” and says the speech was self-contradictory. Erekat fails to mention the ten month freeze on construction of Jewish homes in Judea and Samaria that the Netanyahu government imposed and which the PA chose to ignore rather than renew negotiations.